How cold is where you are? Thread: How cold is where you are? Last night it was down to 6 degrees here in the Sunny South Land of East Tennessee. Now folks I am not a stranger to cold temps with 8 plus years in Alaska but dang it any way that is cold any where. But the old CJ spun the wheels and gears that make her run and she toasted up nice and brown and down the road we went this morning. It went down to 16 degrees here at the other end of the state. At least we didn't have any pipes freeze in our new house. I started the Jeep up about 10 minutes before I left and it was toasty warm. High today is supposed to be 40, so were back to normal over here. Has anybody noticed that Jeeps always seem to run better when it is ice cold? I have had 3 Jeeps and all ran better in the cold. 18 degrees here in Huntsvegas, AL last night. Sunny and cool today. Safety yellow and Handicap blue CJ with 5.3 Vortec/TH400/Tons/Atlas/Roks/Locks and Airshocks. Personally im ready for summer again. Near St. Louis, 10* last night and 5* the night before. I've got the weatherbug icon and just sat here, watching the numbers fall. 1995 YJ 2.5 / 3.5\" BDS Lift w 1/2\" BDS Shackles / 32\" BFG AT Tires / Yellow Top Optima / KC Daylighters / LINE-X Interior / Safari Doors / 20 Gallon Conversion / Much more to come... GO PATRIOTS!!! Lunchbox locker - front or rear? Mods: Weber Carb, Borla Catback, Juicebox TFI, 31\" BFG AT, Powermaster 150a alternator, H4 headlights, blazer heater motor conversion, WORKING gas gauge. Now with 80% less rust!!! At 2:33 about 10 miles north of boston in Wakefield (where I live) it is a sunny 16 degrees right now. -30 degrees celcious with the wind chill! now thats cold. Wow, over here in New Orleans, LA it has been in the 80's feeling really nice outside up until yesterday it went down to 50. I want the 80's to come back. Perfect weather where you can leave the top off from morning through night. We, the Sovereign People of the Universe, wish to live in peace. We live among you, but we are not of you. 60 degrees here in El Paso, but I was up in Albuquerque and Santa Fe for the pass few days, and it was 4 degrees in SF. Beautiful though. 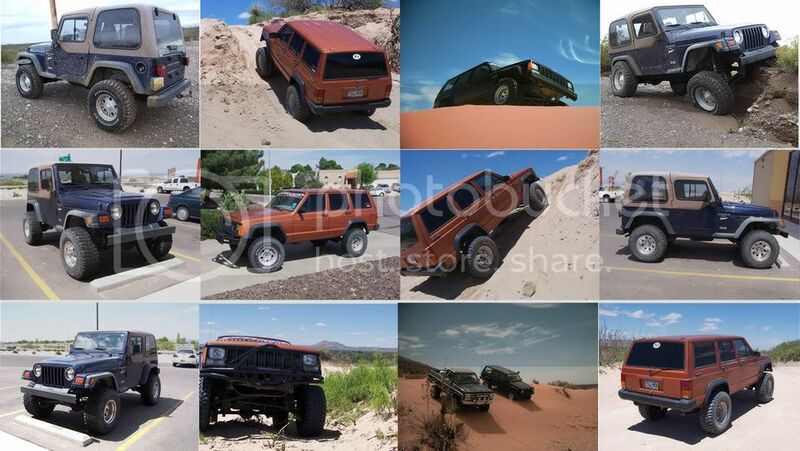 Currently own a 98 XJ bone stock, but click Here: For pics of my TJ and old XJ. -16 here this morning. jeep is dead in the driveway! Dropped down to 35 on the weekend.Highs are 50's. 16 degreees yesterday, with wind chills in the single digits. It is 20 degrees right now. Yeah it's cold, but I'll take it over high 90's, hazy, hot, and humid any day. In the teens. My jeep sat for a day and the water in the gas froze, took me forever to get her started.